Stellenbosch Hills Wine Estate headed the Droewors and Wine tasting trend in 2005 and has proved to be one of the most popular categories of wine tasting in SA! 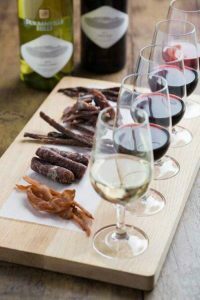 This informative guide will give you some ideas as to what delicious wine pairs with our delicious Droewors to impress your guests with your new found wine knowledge, or entice your other half with a romantic night in. Beautifully cured and spiced, this droëwors is made from the finest quality grass-fed beef. Roasted coriander adds an exotic zest, offsetting the clean spice flavours and ripe tannins characteristic of the reserve. 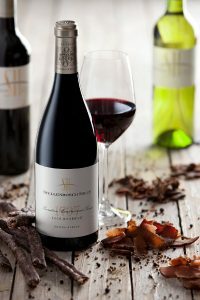 This milder game meat is complemented by the plummy, ripe berry fruit flavours of the well-rounded spiced Merlot. This wine also steak, hearty bredies, roast chicken or lamb. Venison meat is one of the tastiest types of game. The subtle flavours of this premium, dried sausage creates the perfect match for the silky tannin structure of the Cabernet, which also boasts notes of ripe black fruit black currant, sweet spice, cloves, and pepper. This wine also pairs perfectly with red meats. Want to attend a fabulous Wine Tasting event? Vivat Bachus stocks St Marcus Biltong and will be hosting a delicious tasting with St Marcus Biltong and delicious aperitifs such as Baked fig & goat’s cheese crostini with beef biltong shavings for only £25 pp! So, what do you prefer, Beef, Ostrich or Venison Droewors with your vino? Get social and let us know on our social media!